Before you diss the Inspire S2 off as yet another speaker system from Creative's ever growing Inspire family (these speakers are mating even as we speak), can I say that the size of each satellite speaker is just slightly larger than the size of a tennis ball? Although ultimately it still defeats the whole purpose of that by having such a huge subwoofer, I believe we can still live with that as long as its hidden somewhere beneath the table as a leg rest. Besides the small footprint of these speakers, I also like the Aux-In input on the satellite and the adjustable bass control. 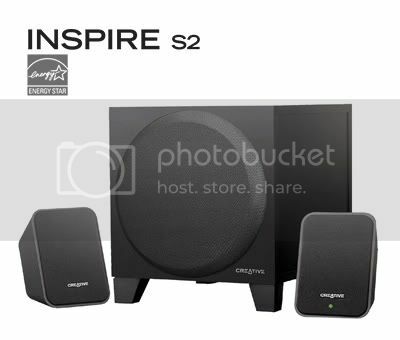 Speaking in Singapore's monetary terms, these speakers are a good $40 bucks more than the recently release Inspire T3130 (also a 2.1 configuration), which brings us to the question of whether the S2 is too expensive for a 2.1 system. Afterall I could add another $10 for a GigaWorks T20 or purchase the Inspire T6160 (5.1) at the same price. The Creative Inspire S2 speaker system is currently available at the Creative online stores [Asia & Europe] at the suggested retail price of S$119 or £69.99.